It would seem to go without saying, but: Before accusing myriad individuals and organizations of defrauding the American people, it’s advisable to make sure you are not currently doing the same. With that in mind, meet Jagadish Shukla, professor of climate dynamics at George Mason University. 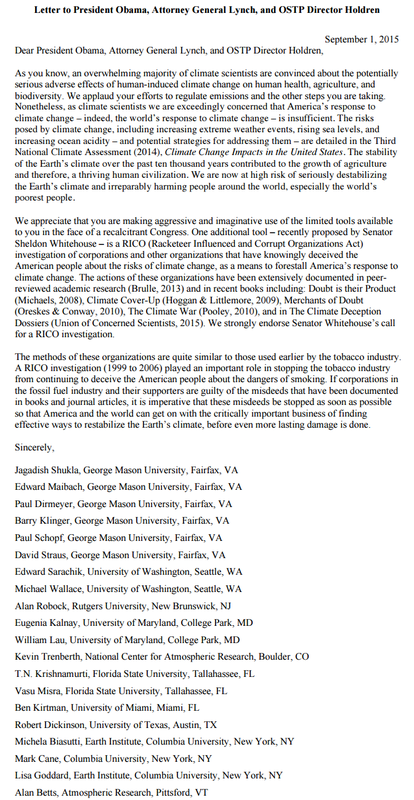 On September 1, Dr. Shukla and 19 other climate scientists sent a letter to President Obama, Attorney General Loretta Lynch, and White House Office of Science and Technology policy director John Holdren calling for “a RICO investigation of corporations and other organizations that have knowingly deceived the American people about the risks of climate change,” a (criminally irresponsible) tactic initially proposed by Rhode Island senator Sheldon Whitehouse in a Washington Post op-ed in May. The letter could be found on the website of the Institute of Global Environment and Society (IGES) — the “non-profit, tax-exempt research institute” founded and headed by Dr. Shukla. The curious disappearance set several people inquiring. It turns out that heading up IGES is nice work if you can get it. The Washington Free Beacon reports that since 2001 the organization has received more than $63 million — 98 percent of its total revenue — from taxpayers, mainly in the form of grants from the National Science Foundation, the National Oceanic and Atmospheric Administration, and the National Aeronautics and Space Administration. And an astonishing amount of that money has ended up in Dr. Shukla’s pocket. Since 2001 the organization has received more than $63 million — 98 percent of its total revenue — from taxpayers. That’s largely because the IGES has a tight-knit staff — very tight. The “business manager” is Jagadish Shukla’s wife, Anastasia, and the “assistant business manager”/”assistant to the president” is their daughter, Sonia. According to the Shuklas’ tax filings, they have pocketed $5.6 million in compensation from IGES since 2001 (not including Sonia’s earnings, which have gone unreported). That is on top of Jagadish’s salary from George Mason — a public university, by the way — which paid him $314,000 in 2014. This “double-dipping” — receiving compensation from a research organization on top of academic compensation — is prohibited by the federal agencies from which IGES receives money, as well as by George Mason University, as detailed by Climate Audit’s Steve McIntyre. Yet IGES officially joined the university, as part of the College of Science, in 2013. One month ago, Jagadish Shukla was encouraging the federal government to treat skeptics of anthropogenic climate change like the Gambinos. Now it turns out that the biggest crime syndicate in this affair is the Shukla family.